Within the last few years, a variety of water heaters have become available to consumers. The following types of water heaters are now on the market: conventional storage, demand, heat pump, tankless coil, indirect, and solar. It is also possible to purchase water heaters that can be connected to your home’s space-heating system. Because the water is constantly heated in the tank, energy can be wasted even when no faucet is on. This is called standby heat loss. Newer, more energy-efficient storage models can significantly reduce the amount of standby heat loss, making them much less expensive to operate. To determine the most energy-efficient model, consult the EnergyGuide label required on storage water heaters. EnergyGuide labels indicate either the annual estimated cost of operating the system or energy efficiency ratings. It is possible to completely eliminate standby heat losses from the tank and reduce energy consumption 20% to 30% with demand (or instantaneous) water heaters, which do not have storage tanks. Cold water travels through a pipe into the unit, and either a gas burner or an electric element heats the water only when needed. With these systems, you never run out of hot water. But there is one potential drawback with demand water heaters — limited flow rate. Typically, demand heaters provide hot water at a rate of 2 to 4 gallons (7.6 to 15.2 liters) per minute. This flow rate might suffice if your household does not use hot water at more than one location at the same time (e.g., showering and doing laundry simultaneously). To meet hot water demand when multiple faucets are being used, demand heaters can be installed in parallel sequence. Although gas-fired demand heaters tend to have higher flow rates than electric ones, they can waste energy even when no water is being heated if their pilot lights stay on. However, the amount of energy consumed by a pilot light is quite small. Heat pump water heaters use electricity to move heat from one place to another instead of generating heat directly. To heat water for homes, heat pump water heaters work like refrigerators in reverse. Heat pump water heaters can be purchased as integral units with built-in water storage tanks or as add-ons that can be retrofitted to an existing water heater tank. These systems have a high initial cost. They also require installation in locations that remain in the 40 degree to 90 degree F (4.4 degrees to 32.2 degrees C) range year-round and contain at least 1000 cubic feet (28.3 cubic meters) of air space around the water heaters. To operate most efficiently, they should be placed in areas having excess heat, such as furnace rooms. They will not work well in a cold space. A home’s space-heating system can also be used to heat water. 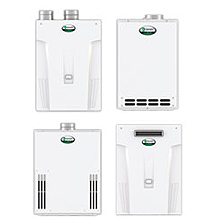 Two types of water heaters that use this system are tankless coil and indirect. No separate storage tank is needed in the tankless coil water heater because water is heated directly inside the boiler in a hydronic (i.e., hot water) heating system. The water flows through a heat exchanger in the boiler whenever a hot water faucet is turned on. During colder months, the tankless coil works well because the heating system is used regularly. However, the system is less efficient during warmer months and in warmer climates when the boiler is used less frequently. 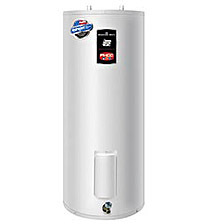 A separate storage tank is required with an indirect water heater. Like the tankless coil, the indirect water heater circulates water through a heat exchanger in the boiler. But this heated water then flows to an insulated storage tank. Because the boiler does not need to operate frequently, this system is more efficient than the tankless coil. In fact, when an indirect water heater is used with a highly efficient boiler, the combination may provide one of the least expensive methods of water heating. Through specially designed systems, energy from the sun can be used to heat water for your home. Depending on climate and water use, a properly designed, installed, and maintained solar water heater can meet from half to nearly all of a home’s hot water demand. Two features, a collector and a storage tank, characterize most solar water heaters. Beyond these common features, solar water-heating systems can vary significantly in design. The various system designs can be classified as passive or active and as direct (also called open loop) or indirect (also called closed loop). Passive systems operate without pumps and controls and can be more reliable, more durable, easier to maintain, longer lasting, and less expensive to operate than active systems. Active solar water heaters incorporate pumps and controls to move heat-transfer fluids from the collectors to the storage tanks. Both active and passive solar water-heating systems often require conventional water heaters as backups, or the solar systems function as preheaters for the conventional units. A direct solar water-heating system circulates household water through collectors and is not appropriate in climates in which freezing temperatures occur. An indirect system should not experience problems with freezing because the fluid in the collectors is usually a form of antifreeze. If you are considering purchasing a solar water-heating system, you may want to compare products from different manufacturers. As with any purchase, balance the pros and cons of the different water heaters in light of your particular needs. There are numerous factors to consider when choosing a new water heater. This publication has already described different system configurations. Some other considerations are capacity, efficiency, and cost. Although some consumers base their purchases on the size of the storage tank, the peak hour demand capacity, referred to as the first-hour rating (FHR) on the EnergyGuide label, is actually the more important figure. The FHR is a measure of how much hot water the heater will deliver during a busy hour, and it is required by law to appear on the unit’s EnergyGuide label. Therefore, before you shop, estimate your household’s peak hour demand and look for a unit with an FHR in that range. Gas water heaters have higher FHRs than electric water heaters of the same storage capacity. Therefore, it may be possible to meet your water-heating needs with a gas unit that has a smaller storage tank than an electric unit with the same FHR. More efficient gas water heaters use various nonconventional arrangements for combustion air intake and exhaust. These features, however, can increase installation costs. Once you have decided what type of water heater best suits your needs, determine which water heater in that category is the most fuel efficient. The best indicator of a heater’s efficiency is its Energy Factor (EF), which is based on recovery efficiency (i.e., how efficiently the heat from the energy source is transferred to the water), standby losses (i.e., the percentage of heat lost per hour from the stored water compared to the heat content of the water), and cycling losses. The higher the EF, the more efficient the water heater. Electric resistance water heaters have an EF between 0.7 and 0.95; gas heaters have an EF between 0.5 and 0.6, with some high-efficiency models around 0.8; oil heaters range from 0.7 to 0.85; and heat pump water heaters range from 1.5 to 2.0. Product literature from manufacturers usually gives the appliance s EF rating. If it does not, you can obtain it by contacting an appliance manufacturer association. Some other energy efficiency features to look for are tanks with at least 1.5 inches of foam insulation and energy efficiency ratings shown on the EnergyGuide labels. Another factor uppermost in many consumers’ minds is cost, which encompasses purchase price and lifetime maintenance and operation expenses. When choosing among different models, it is wise to analyze the life-cycle cost — the total of all costs and benefits associated with a purchase during its estimated lifetime. More information on conducting life-cycle cost analyses is available from EREC. Units with longer warranties usually have higher price tags, though. Often, the least expensive water heater to purchase is the most expensive to operate.